On a recent sunny Sunday, I had a chance to revisit one of my favorite spots in the Bay Area: Point Bonita. Located on the north side of the Golden Gate, the point marks the entry to San Francisco Bay and provides for stunning vistas of the Marin Headlands, the Golden Gate Bridge, and the Pacific Ocean. The Point Bonita Lighthouse provides a beacon for ships attempting to navigate the treacherous entrance to San Francisco Bay. To get to the lighthouse, one must navigate a half-mile trail from the parking lot that includes a walk through a tunnel dug by Chinese laborers who worked on the transcontinental railroad in the nineteenth century. Unfortunately, the trail is open only from 12:30 to 3:30 p.m. on Saturdays, Sundays, and Mondays. 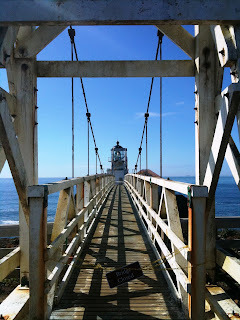 Even more unfortunate is that the suspension bridge that connects the end of the trail to the lighthouse has seen better days and is closed for repairs until the spring of 2012. 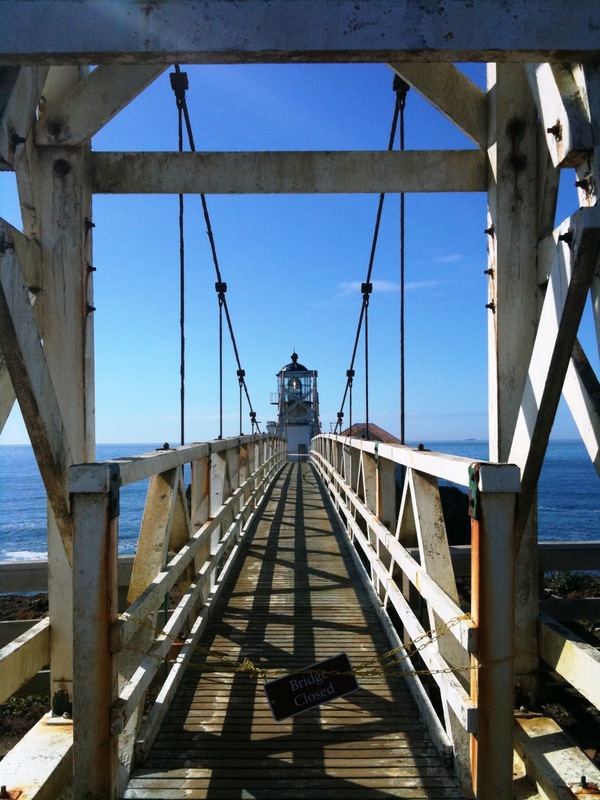 As a result, the lighthouse is currently inaccessible to visitors. Nevertheless the walk to the end of Point Bonita is worth it just for the views. If you would like to take a private, custom tour that includes a visit to Point Bonita, your best bet is to schedule a full-day San Francisco and Muir Woods Tour (The Perfect Day Tour). For more information, contact Blue Heron Custom Tours and Travel at (866) 326-4237 (toll free) or Rick@BlueHeronTours.com. The new "Zagat 2011 San Francisco Bay Area Restaurants" and "The Michelin Guide San Francisco, Bay Area, and Wine Country Restaurants 2011" were recently released. So it's time for Blue Heron's annual summary of the critics' choices for the best restaurants in San Francisco and the Bay Area. Zagat's list of the five most popular restaurants includes Gary Danko, Boulevard, Slanted Door, French Laundry (Yountville, Napa Valley), and Cyrus (Healdsburg, Sonoma County). The top rated overall are Gary Danko and French Laundry with 29 points. Cyrus, Sierra Mar (Big Sur), Acquerello, La Folie, Erna's Elderberry House (Oakhurst, south of Yosemite National Park), Hana Japanese (Rohnert Park, Sonoma County), and Chez Panisse (Berkeley) received 28 points. (All restaurants are in San Francisco unless otherwise noted). Once again, Michelin awarded three stars to the French Laundry (Yountville, Napa Valley). However, for the first time, a second restaurant, The Restaurant at Meadowood (near St. Helena, Napa Valley), also received three stars. Two stars were awarded to Cyrus (Healdsburg, Sonoma County), Coi in San Francisco, and Manresa in Los Gatos. Thirty-nine restaurants in the Bay Area received one star. The "San Francisco Chronicle" awards four stars to the top restaurants. Current recipients are Chez Panisse in Berkeley, Cyrus in Healdsburg, Manresa in Los Gatos, French Laundry in Yountville, The Restaurant at Meadowood near St. Helena, and Coi, La Folie, and The Dining Room at the Ritz-Carlton in San Francisco.